Most jobs I start on my beloved 30 foot, 1970s Albin Ballad, Triola, I begin with a benign sense of suspended reality. I leave home after breakfast with a spring in my step and suggest I’ll buy the long suffering and ever supportive first mate (my beautiful wife, Elizabeth), the galley swabs and the less than supportive ships dog lunch as “I’ll be done by then”. By the time they arrive at the yard, I am usually bleeding from somewhere and have revised my timescales from hours to months! This job was somewhat different; I always knew it would be huge. All the deck fittings would need to come off, all the hatches too, I’d need to get the boat under cover, prepare the deck and then paint it. Due to the enormity of the job, with each year that I approached it, I put it off, and each year when she was in the water, I’d try some new miracle cure for aged, crusty, chalky and dirty 1970s gelcoat. 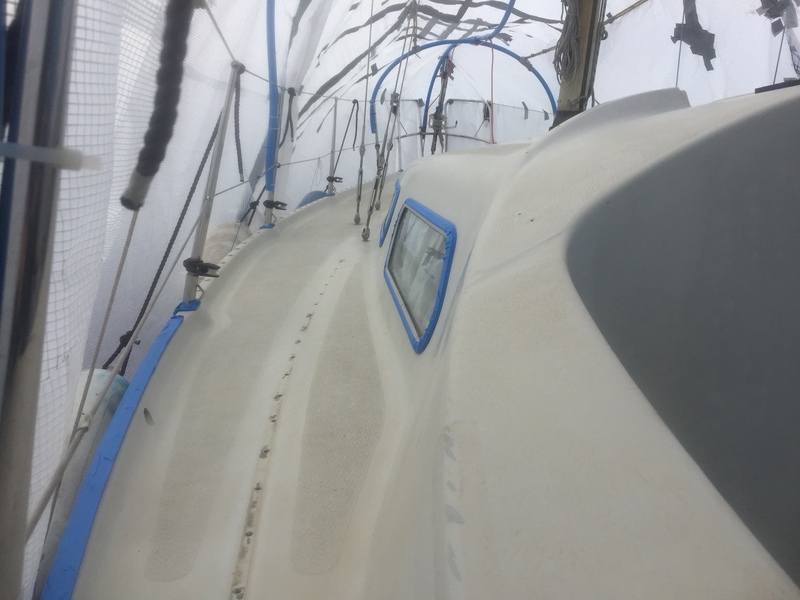 From pressure washing, to wizzy cleaning products, to compounding with a 14-inch polisher, nothing worked and I’d find myself stammering apologies to visitors to the boat claiming I’d be painting her weary decks over the winter. The crazed cracks around cleats, the rust patches around old fittings, the areas of gelcoat that had nearly worn through, the persistent dirty look of the deck and the many pin holes worked on my mind, and I resolved that this winter, the job could no longer be put off. You have two options when painting your decks, single pack (also known as 1k, single component or one pot paint) and two pack (also known as 2k, two component or two pot paint). Single pack paint does not require a hardener, catalyst or activator and dries in the air. Two pack paint needs to be mixed with a hardener and is chemically cured. Two pack paints are about twice as durable as single pack paints, however, they require a little more care as you must get the mixing ratios correct and consider over coating times and temperatures. One pack paints can be painted over the top of two pack paints (in fact, International suggest two pack paint is patched up with one pack paint if the coating is damaged), however, two pack paints cannot be applied over one pack – so if you already have single pack paint on your decks, short of stripping it all off, your options may be limited. Another consideration is that two pack paints are considerably more expensive than one pack paints. As I wanted this to only be done once (and with the voice of my late father, who was a shipwright, ever present, telling me two pack was the best stuff to put on such an abused area as the deck), I decided I’d take the cost hit and selected two pack paint. Next, I needed to decide on the brand. Internationals paints are anything but cheap, however, along with Hemple, they lead the way with paint technology and their 2k Perfection brand paint is designed specifically for application by brush and roller and has what appear to be magical powers of self-levelling. I fired an email to Internationals technical email address with some questions about my planned deck painting process, which was promptly responded to. Their response then seeded another plethora of questions, that I then penned back to their technical department in a mildly OCD, bullet pointed and verbose email list… radio silence followed… I approached my good friends at the Pirates Cave chandlery with my list of questions in hand, and Nathan, their sales manager, set about with some gusto finding the answers to my many (and occasionally daft) questions so I could build my strategy. 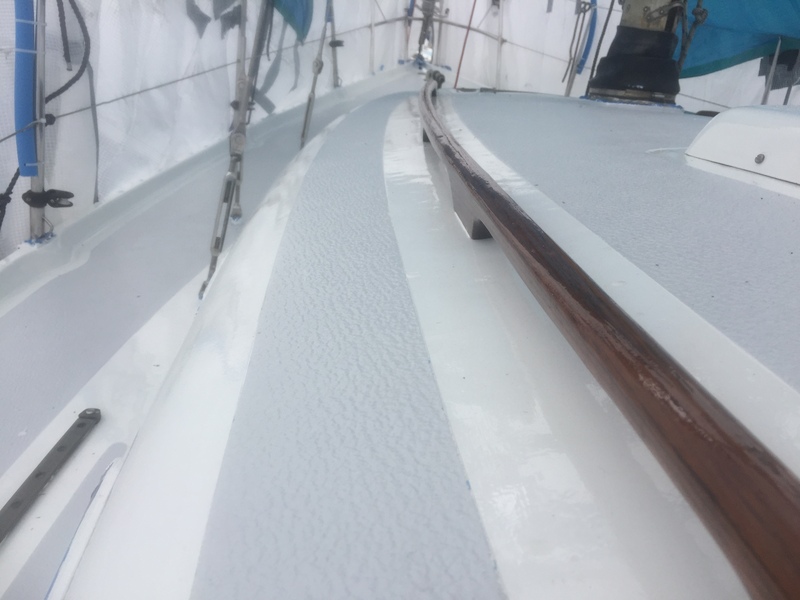 As for the choosing the design, two fellow Ballad owners, Nicholas Koligiannis and Joern, had gone for a two tone look, with the non-slip being a different colour to the slick areas. I decided to go for Platinum (effectively light Grey) on the non-slip areas and off white (which has less glare than pure white) on the slick areas. The final decision I had to make is how and when I should paint it. 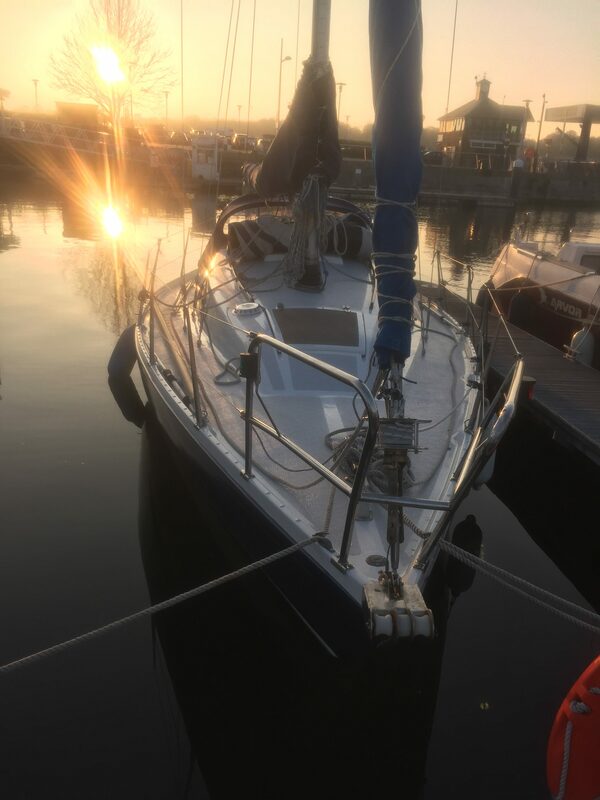 I was loathed to drop the rig (a mistake in hindsight), and I didn’t want to waste any time in the sailing season not sailing. After calling around the Medway, I found getting somewhere under cover for Triola would either mean sailing a long way down river to take her out, or paying a vast sum of money, neither of which appealed. It was early February and we were having some lovely weather and I thought, what the hell, why not just put a tent over the deck, spring is just around the corner! After some frantic messaging on the PBO forums, some fellow readers responded with a cracking idea. 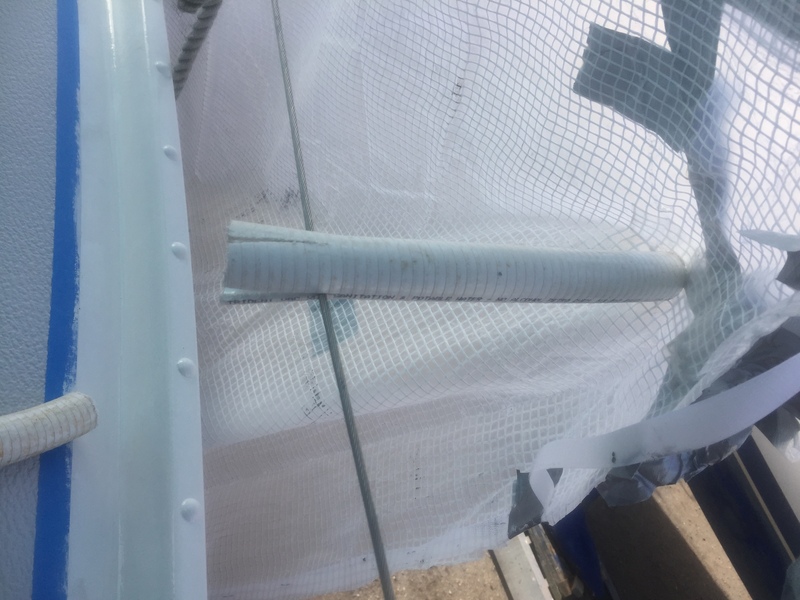 Cut blue 32mm MDPE water pipe into hoops and anchor them with cable ties to your stanchions, add some ridge poles and then spread a tarpaulin over the whole lot. I set about planning in Google SketchUp, a very easy to use, free (for personal projects), to scale, 3d visualisation piece of software, how I would put up my great deck tent. Once I had my plan, I purchased the bits I’d needed. From Toolstation I purchased 25 meters of pipe for £22.86 and from Tarpaflex I purchased a medium weight (170gm), reinforced, clear (so I could see underneath it to paint) eight meter by ten meter tarpaulin for circa £70. From B and Q I purchased some lengths of bamboo to use as my secondary ridge polls for around £10. In the bat cave, I cut my 25 meters of pipe into the correct lengths from my SketchUp plan, and drilled two holes in each end (so that I could run cable ties through them to the stanchions) and one hole at its central point, so the ridge pole could be connected to the frame. I chose to make the main, central ridge pole, from the same pipe I was using for the frame – this turned out to be a mistake as it was too flexible and as soon as the little tent heated up, it all went a bit droopy. Another mistake here was that I didn’t pre-cut the tarpaulin and figured this would be easier to do in the yard, little did I know! Armed with my cut and drilled frame, tarpaulin, acres of gaffe tape and cable ties, I figured I’d easily get the tent up in an evening after work. I arrived at 7pm and by 9pm, the frame was up and I thought how hard can it be to pull the tarpaulin over the top of it? I foolishly abandoned my design and I figured I could get the tarpaulin over the boat in one, wrap around piece. I wrestled, I tugged, chopping a bit here, a bit there and I pulled for four hours until totally exhausted at 1am, I headed home frustrated and unsatisfied with the result. The tarpaulin was over the boat alright, but it was anything but straight! 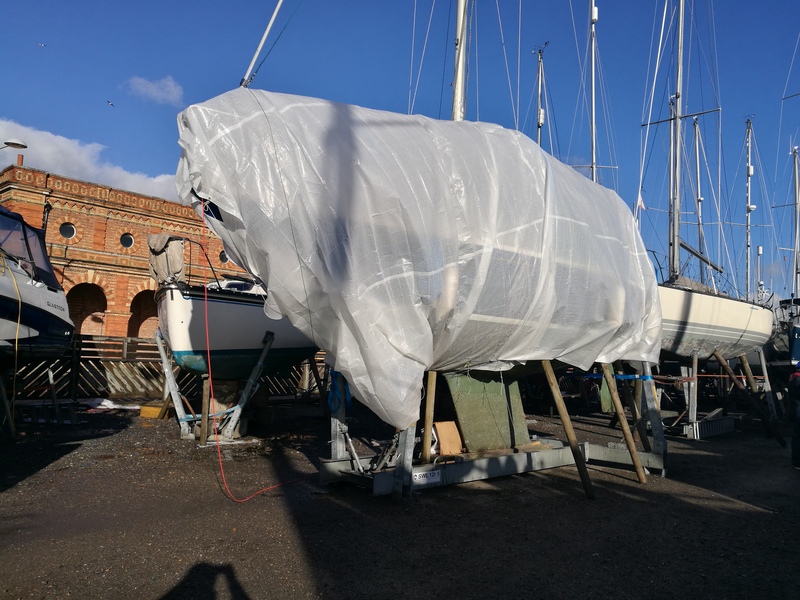 I went down to the boat the following Saturday and after a mornings work, the tarpaulin was straightened out and all secure and I was much happier with the result. All the joins around the rig were taped up with tarpaulin repair tape in some places and gaffe tape in others. I fitted lights inside to the ridge pole and fed power via the ridge pole too. The deck tent was complete and lovely and cosy to boot; you’ll find even on the coldest of days it will warm up like a big, backbreaking, greenhouse. Don’t kid yourself though, with the rig up, you will never make this deck tent fully water tight, some water will still find its way down the mast and down the rigging. It will keep the majority of water off, even in the worst downpours and most importantly it’ll keep any contamination off your decks and protect you fully from any wind. Beware though, when the wind does blow, you will find it pretty oppressive to be under the tarpaulin, as it thrashes deafeningly around you and threatens your newly painted toe rails. Having never painted my deck I had no idea how much paint or materials I’d need. The technical documents give some details about coverage, however, calculating your exact deck area in meters squared is far from straight forward. I sought some advice on the PBO forums, and eventually marched into the Pirates Cave with the shopping list below and Nathan gave me a cracking deal. 10 x good quality 2” brushes – don’t scrimp on these even though you’ll likely dispose of them after a single coat (you can wash them and use them on the same colour coat with the #9 thinners). I had great success with the brushes at The Range where a pack of five No-Loss brushes cost only £5. Thermometer with humidity setting – £5.99 from Amazon Prime. Sponges and microfiber cloths – The Range. Sika 291i white – £13.29 from the Pirates Cave. 2 boxes of 10 Tack Cloths – £7.75 from Axminster. A wire brush – £3.10 from Axminster. A good palm sander with extraction is useful, I use the Festool RTS 400. Two pack paint is nasty stuff and if you Google it, you’ll be at risk of quickly putting yourself off using two pack paint due to the many thousands of hits regarding isocyanates. If you spray two pack paint without a proper, full face air fed mask, with a three-stage filter, compressor and all the very expensive and cumbersome paraphernalia that goes with it, it could change your life forever, leading to life threatening occupational asthma. Painting two pack using a brush and roller, however, will put no measurable isocyanates into the air at all. The HSE did a study in 2005 (which makes interesting reading here: http://www.hse.gov.uk/research/hsl_pdf/2005/hsl0560.pdf) which confirms this. The absence of isocyanates does not make these products safe – the solvents in these paints, especially when painting large areas in a confined space, in the rather grim words of the HSE “Unconsciousness and even death can result from exposure to high concentrations of solvent vapours.”, read more here http://www.hse.gov.uk/pubns/indg273.pdf. 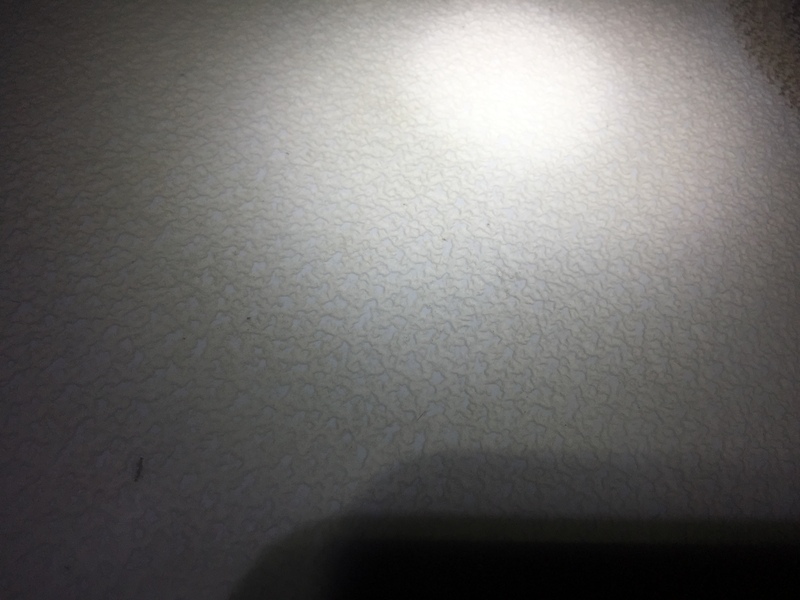 They are also explosive when in higher concentrations, and even though you are at a very low risk of creating these concentrations through this process, avoid using electrical devices when you are painting with this stuff. Don’t be lulled into a false sense of security by your respirator either. When I was painting my forehatch and main hatch in the bat cave on a grim and cold night, I closed the garage to keep the temperature up and the wind out thinking the fumes from such a small painted area would be negligible and my respirator would protect me. I felt pretty bizarre afterwards I can tell you! So, ensure ventilation at all times even with proper breathing gear and make sure you can’t smell any paint fumes at all, and you’ll likely be safe. As ever, you use these products at your own risk! 2 x 100 disposable resin resistant gloves – Don’t go cheap here. I get Aurelia Bold Black Nitrile gloves that are thicker than cheaper variants. – £8 from Amazon Prime. A respirator with the best filter you can get that deals with organic vapours. I use a JSP Force 8 Maximask with the most expensive filter – £25 from B and Q.
Knee pads – These will be the best gift you will give yourself on this job. You will be spending lots of time on your long suffering knees, so do them a kindness and get yourself some knee pads – £10 from B and Q. Timing is everything! With two pack paint you have an over coating ‘window’ where the previous coat may be successfully over coated with the next coat and a chemical bond will occur. If you try and paint a subsequent coat too soon, the paint may still be sticky or will ‘liven up’ again with the solvents in the new coat you are applying. On the other hand, if you try and paint a subsequent coat too late, the paint will have gone off and you will have missed your chemical bonding time. If you miss this over coating window, it’s far from a disaster, it just means you need to sand that previous coat down with 320 to 400 grit (which will ultimately give you a better finish anyway) giving a mechanical key for the next coat, tack cloth it off and then apply that next coat. The full process will see the deck covered in all places with at least six coats on the off-white sections, and seven coats on the grey sections. The over coating times vary greatly depending on the substrate temperature. International have technical documents for each of their products and they provide a guide to exactly how long you have. 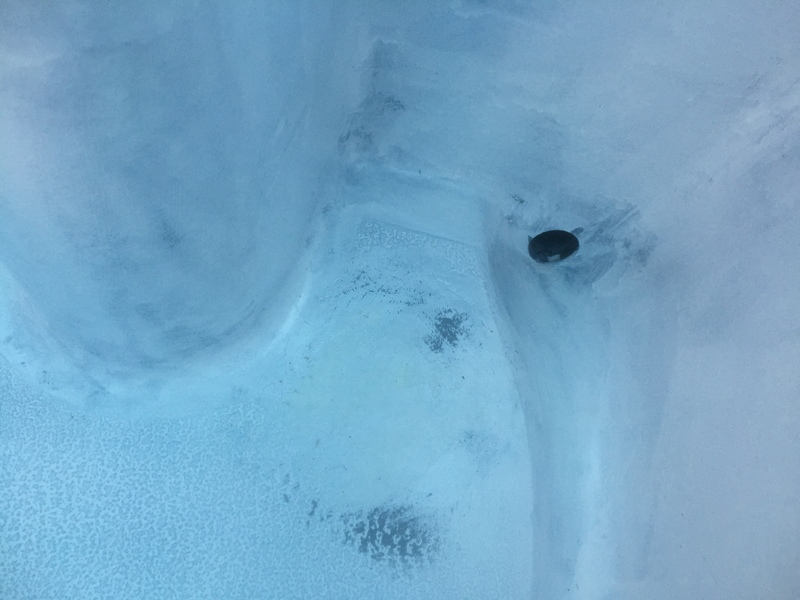 We are painting in imperfect circumstances where we cannot regulate the temperature, so calculate what the likely average surface temperature will be, and pick a time in the middle of your overcoating period to give yourself as much of a margin for error as possible. If, like me, you are employed nine till five, you are going to need to take some time off and hope and pray the weather doesn’t get in your way. 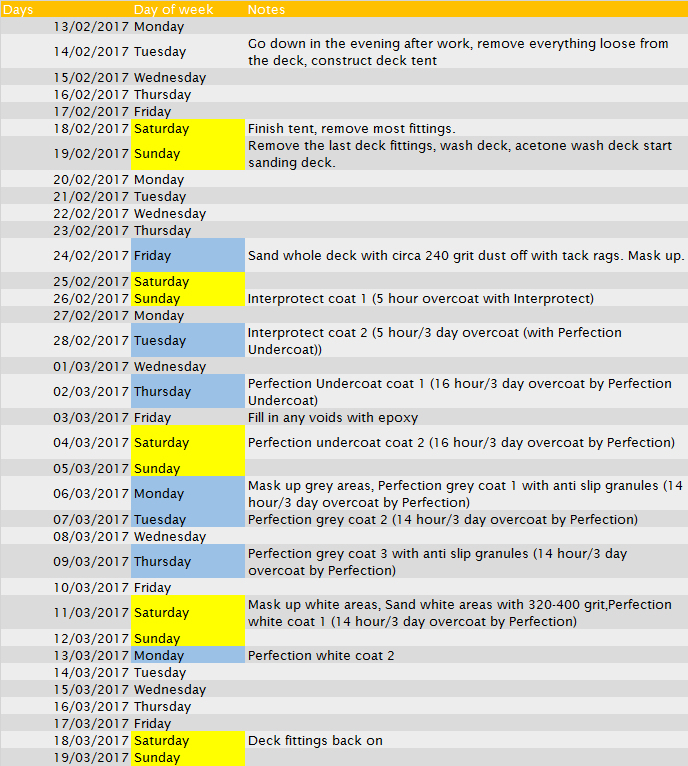 I laid the painting schedule out as below, the yellow marked days being weekends, the blue were days taken as a half day leave. Paint scheduleSo, you’ve chosen your method and design, planned your paint schedule and erected your exciting, flappy deck tent. The one final consideration you may find yourself wringing your hands about is ambient temperature, surface temperature, humidity and dew point. Put very crudely, the atmosphere can only hold so much moisture, if the atmosphere is already saturated (so greater than 80% relative humidity), the solvents in any paint you apply will have nowhere to go meaning it will take longer to dry. Additionally, if the surface temperature drops, you stand a chance of dew forming – if dew forms on your lovely, freshly painted topcoat, it will take the gloss off. For your purposes, as part of this project, I would be very surprised if you get tripped up by this. Your clear tarpaulin will keep your deck nice and toasty and prevent dew from forming. I also found, so long as I was painting in the middle of the day (or even better, late morning), the relative humidity was down at around 60%. I was so worried about these factors I purchased a laser temperature gauge to measure the surface temperature, and a sensor from Amazon to measure relative humidity and temperature and put together all sorts of wonderful grids to calculate temperature vs humidity vs dew point – these are not included in this article as they were a bit of a waste of time in these circumstances. So long as you avoid painting in north of 80% humidity and are painting in some form of cover, above 5 degrees, you will likely be okay. So, planning finished, jollop and ancillaries purchased (and penury assured), deck tent up, PPE in abundance and fears abated, it’s time to check your health insurance to make sure it covers osteopathy, take a deep breath and get cracking! However restrained you are, this job isn’t just going to be painting your deck, this is going to be a full deck refit by the time you are done. Once you have that old deck fitting off that’s always subtly offended you, there is no way you will bring yourself to put it back on. Those grab rails you take from the deck that are faded, grey teak? And the trim from your main hatch? You are likely not going to be able to resist getting all jazzy with the varnish to make them beautiful again to go back on your newly manicured deck. That old vent opening that is no longer used and has always irritated you? You’ll find yourself not able to resist glassing that up before you paint. So face facts, this big job has just got a little bigger. That put to one side, don’t underestimate the process removing your deck fittings. Most will have been firmly wedged in place for forty years and will be reluctant to come away. Many old screws, such as the long skinny brass screws holding my grab rails in place, will sheer off and need drilling out. 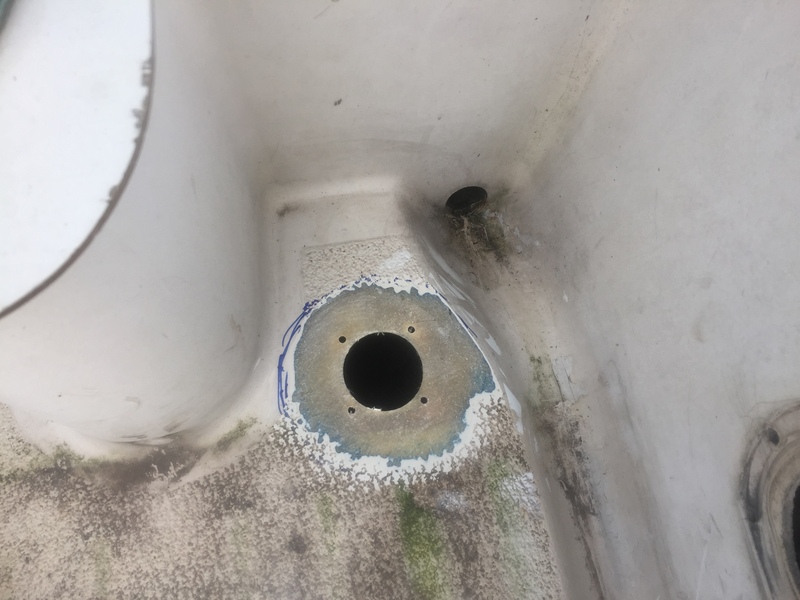 Some kindly previous owner had put an aluminium backing plate at the aft end of the main jib track that the stainless machine screws pass through – you can imagine how easy that was to remove after the process of galvanic corrosion had welded the screws to the backing plate! Take photos of everything before you begin, and I mean everything, from every angle leaving you in no doubt where that screw went, and which way around the other deck fitting was orientated. For each deck fitting I removed, I put the fasteners and any small parts into a sealed sandwich bag and labelled it up with a bit of masking tape to make sure I didn’t lose anything and to make the process of putting the deck gear back on that much easier. I made a mistake at this stage, I didn’t carefully inspect all these fasteners as I removed them – it’s wise to do this and replace any that look in the slight bit knackered, mangled or in any way sub optimal. The bolts that held the jib sheet track down had been ground off to length with a cutting disc when the boat was manufactured, leaving some pretty shocking threads at the end of the bolts. They came off easily enough, however, getting them back onto the track once I had painted the deck was another matter. Inspect all fasteners carefully, and if in doubt, replace them. Take off as much as you dare! For one, you’ll end up with a better result the more you take off, and for two you’ll thank yourself later as you’ll have less to mask up and less to paint around. I left my toe rail tracks on, my mainsheet traveller in place (the reason for this being I couldn’t get the wretched thing off!) and my windows in as, after sealing up one of the windows in a previous project, I was worried I’d never successfully seal them up again if I removed them! 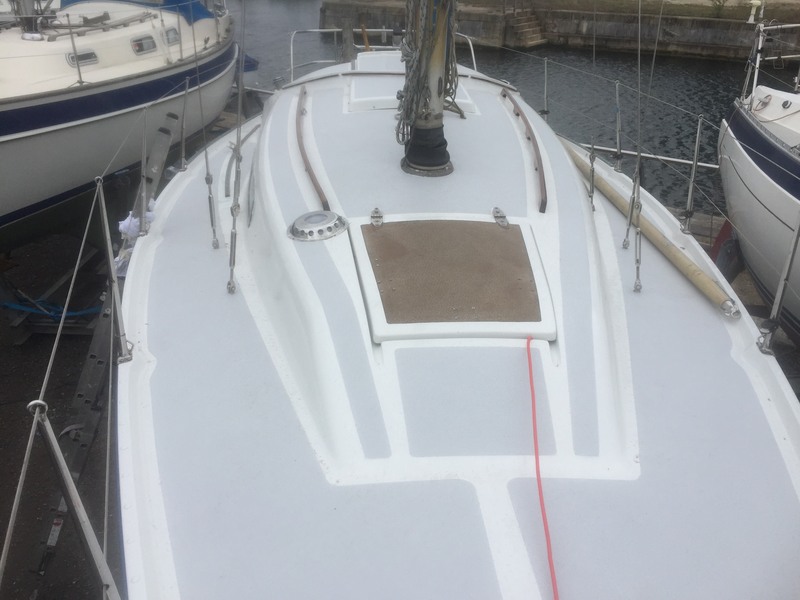 I removed all cleats, the Jib track, the sprayhood and all fittings, the grab rails, the fore hatch, main hatch, main hatch garage, vents, winches and main hatch trim, using a sharp chisel to remove any silicon left on the deck or the fitting as I went. Pick yourself up, and to misquote Lewis Carroll, “Begin at the beginning, and go on till you come to the end: then stop.”. The first job is to get the deck clean and uncontaminated. All those miracle cures for fibreglass? All that polish? Well that all needs to come off now, so get scrubbing. I started with diluted International Super Cleaner in two buckets making sure to wear gloves and to not let this stuff get on my skin, and began at the bow and worked my way aft. Then, with clean buckets of water, started the process all over again, being sure to get into all the nooks and crannies and scrubbing in the non-slip areas of the deck. Satisfied the deck was now clean, it was time for the acetone wash of the deck to remove any waxes, oils or other contaminants. Make sure you use your respirator and gloves for this part, and check your gloves regularly as with acetone on them, they will only last so long before they start to break down. I got my acetone out and my clean, white rags from East Coast Fibreglass (old T-shirts will do), and got to work, bow to stern, once again. If, like me, you have left your windows in, try and avoid getting the acetone on anything rubber as it will break it down if it remains on the rubber for any length of time. Finally, crack out your wire brush – it might sound a bit brutal for your decks, however, I wanted to make sure the deep non slip texturing was fully clean before I painted it, it will also help key the ‘valleys’ in the texture, and your epoxy primer will soon smooth it all out. A week or so after my deck tent went up and I take all my deck gear off, leaving my boat at its most prone, what do you think happens? You got it, Storm Dorris arrives with winds of 60Mph forecast. The ever helpful and cheerful Wayne at MDL Chatham called me up and sucked his teeth at me and asked if I could take the tarpaulin down due to the windage it would add. I pointed out Triola had no deck fittings on and that was not possible. The marina agreed to keep an eye on her when the storm came. I popped down the weekend before and put a deck level ‘back up’ tarpaulin underneath my deck tent, and with a heavy heart, left her to weather the storm. On the day of the storm, winds built to around 60Mph by midday, Wayne helpfully called me at the office and said the tarpaulin was hanging tough. I felt pretty confident at this point, the winds had reached their predicted heights and my deck tent had stayed in place. I even went so far as to email a picture to Jessica at Tarpaflex bragging, in way of recommendation, that their tarpaulin had survived the storm… which, of course, tempted fate. 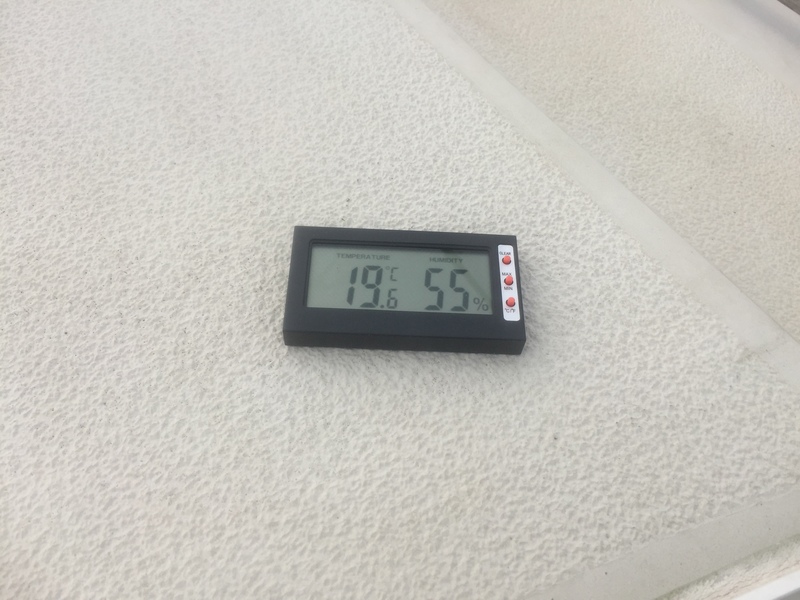 Over the next few hours the winds built to a staggering 110Mph at the lock offices (which is the strongest wind they have recorded at Chatham – one week after I put up my deck tent – typical! ), and it was too much for my deck tent, it chaffed through on the back stay and tore down its centreline all the way up to the mast where it was secured with evidently indestructible gaffe tape. There it proceeded to flog itself to oblivion in the violent winds. When I got down to the boat at the weekend I was thankful I’d put the ‘backup’ deck level tarpaulin on as no water had reached the inside of the boat, but what a sorry state she was! 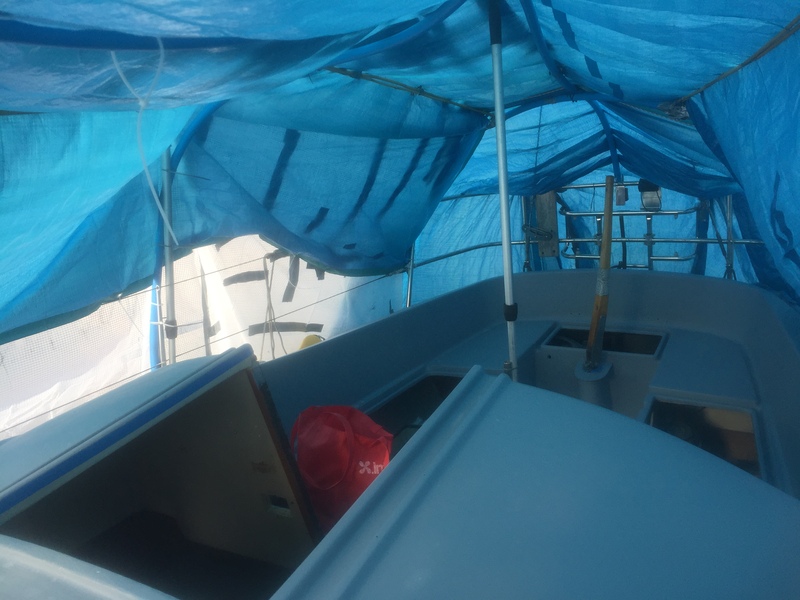 I dropped the tarpaulin off the boat, taped it up, and pulled the sorry looking affair back over the boat. After all that flogging, the tarpaulin was never water tight again, even with the miles and miles of gaffe tape I tried to patch it up with and I resorted to slinging an additional cheap tarpaulin over the top as the storms blew through and propped up the frame with two boat hooks (another reason you can never have too many boat hooks!). After cleaning up any leaves and other debris that had blown in whilst the deck tent was down, it was time to continue with the job in hand. Now we have a clean uncontaminated deck, she will look a little less sorry for herself and we can get to work keying the surface ready for our epoxy primer. Use your coarse 180 grit Mirka Abranet Abrasive sheets and use your palm sander where you can although you will find you will need to resort to hand sanding in a lot of cases. Don’t scrimp at this stage – 80% of any paint job is preparation, so get in all those corners, nooks and hard to reach places. Once you have finished sanding, tack rag off any dust, making at least two passes to ensure all the dust has been removed. If 80% of the job is in the preparation, then 15% is in the masking! If you get this part wrong, you will kick yourself when all the hard work is done. Go carefully and slowly and invest in good masking tape (PBO April had a cracking article looking at masking tape. ), I plucked for the ScotchBlue standard blue painters tape pretty much throughout. Make sure you run a microfibre cloth and your finger along the ‘wet’ edge of the masking tape (not the dry edge too, else you might struggle to get it off when all the work is done!) to make sure you have nice clean lines once the tape comes off. Finally the time has come to get suited up in all your PPE and to start applying some paint! Pay attention to the mixing instructions on the tin, International InterProtect is mixed 3 parts paint to 1 part hardener by volume! Don’t make the mistake I did of using a set of scales as it won’t work and you’ll end up adding too much hardener to your mix (In my defence I am used to working with WEST SYSTEM epoxy that is 5 to 1 by either weight or volume!). Carefully open both the pot of epoxy paint and the pot of hardener (the hardener has almost the viscosity of water, so be careful not to slosh it everywhere). Stir both the paint and the hardener fully, and then carefully pour 100ml of hardener into your calibrated measuring cup, followed by 300ml of epoxy, and then fully mixing it. You now need to wait for ten minutes for the bubbles in the epoxy to disperse. Use this time to get put the lids back on the paint, get your paint brush out, and get your 10cm roller on the frame. You will likely need to mix up a couple of these 400ml batches to cover the whole deck. An important question to ask yourself at this stage is how you are going to get the hell off the boat once you are done so you don’t paint yourself into a corner! The ladder was put up the starboard side amidships, so I chose to paint the foredeck first, work my way aft on the port side, paint around the cockpit, before retreating to the ladder and then exiting. 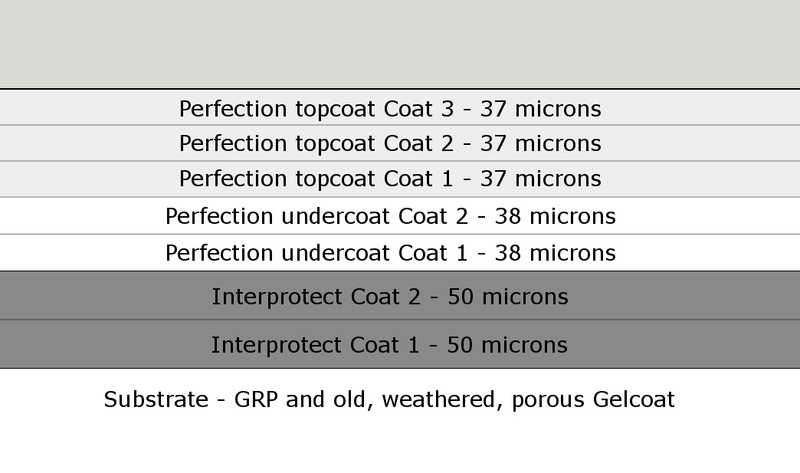 This coat will take a long time to go on, and if your gelcoat is as porous as mine was, it’ll take quite a lot of paint too. I put aside three hours for this coat, some five hours later I was done! There is little more satisfying than watching all the wretched old chalky gelcoat and crazed cracks that have bothered you for years disappear under grey, uniform, epoxy. You will also start to notice at this stage the sheer number of little pin holes you have through that old gelcoat and any other imperfections that were hitherto not obvious. In addition to the many pin holes that needed filling, I had some old unused, in some cases, unidentifiable, deck fittings that had long bugged me, so I took those out, bevelled the area around the holes and then calculated, to make up the 50mm of GRP back to its original strength I would need around 10 layers of 300gm biaxial glass fibre reinforced with epoxy resin. I used Google Sketchup again to make a ‘to scale’ print out of the layers of glass I’d need and then cut around this template in the bat cave, as well as cutting out a square of polyester release film to act as a backer to stop my fibreglass plug falling into the hole I was trying to fill. 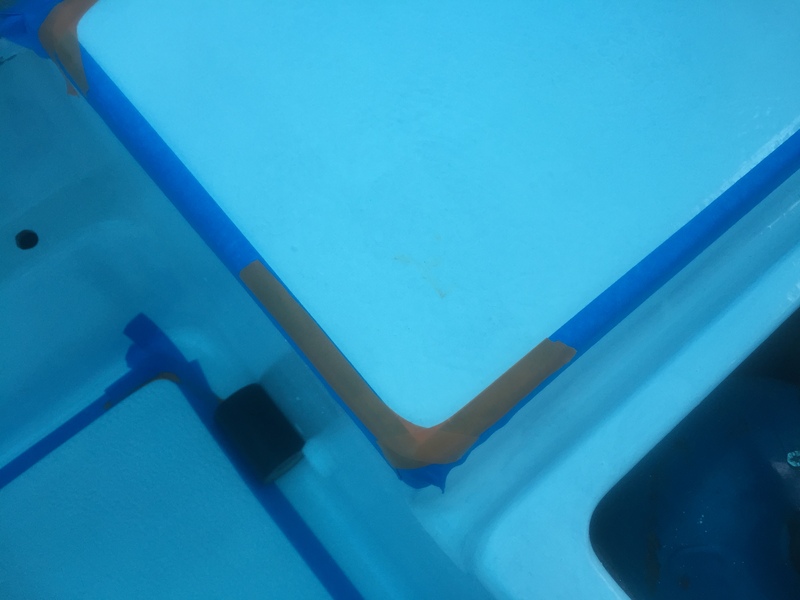 I gaffe taped the release film over the back (or where I could front) of the holes to be filled and wetted out each layer of fibreglass and applied them one by one. Once the West System epoxy had all gone off, I made sure to wash any holes I had patched with warm soapy water to remove any amine blush. I then sanded these back, and filled any remaining depressions (and indeed any other hole or imperfection I could fine) with West System epoxy and 407 Low density filler mixed to the texture of peanut butter. West tell us 407 filler is ‘easy’ to sand, by which West mean it’s easy when compared to their other fillers, but believe me, it is still tough as old nails, so make sure you are tidy and remove any excess else you’ll be in for a struggle later on. Remember, once the filler has gone off, wash these areas too with warm soapy water too to remove any amine blush (else your paint won’t stick! ), and then sand them flush. With all holes filled and a nicely faired deck, so long as you are within your overcoating time (if you have exceeded this, you will need to sand your epoxy down with 320 grit), it’s time to apply our two coats of undercoat. The undercoat is mixed 3 to 1 by volume again, so get out your calibrated mixing cups, stir both the paint and the hardener fully and once again, pour out 100ml of our hardener, followed by 300ml of paint and stir the two components together and leave for ten minutes for the bubbles to disperse. 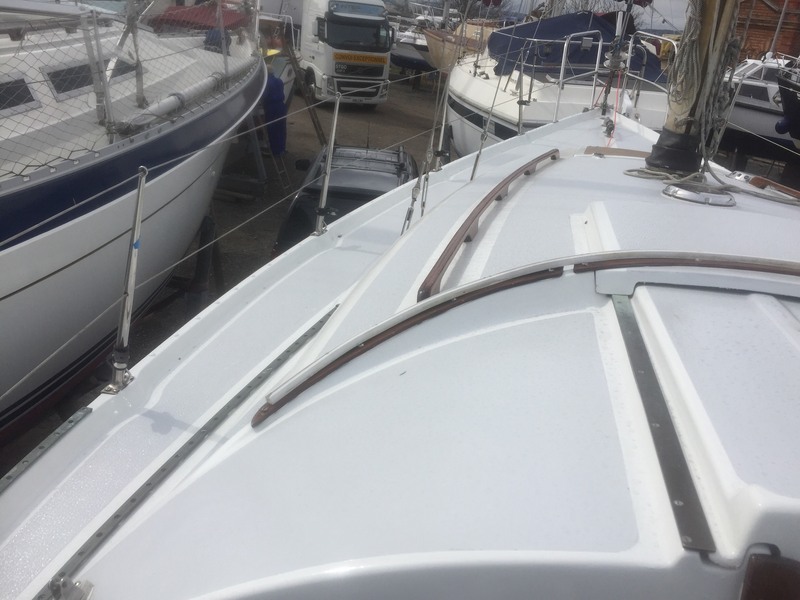 The first coat of the undercoat will, like the first coat of epoxy, take considerably longer than you might think, however, you can console yourself that these are the last two coats where you will be doing both the non-slip and the slick areas of the deck! Once you are done, you’ll be left with a lovely, shiny, finished undercoat that will give you a hint of your finished result. As I couldn’t effectively sand my non-slip area as the ‘valleys’ of the non-slip texture were too deep, I needed to be sure I painted the non-slip areas first so a chemical bond would occur between the undercoat and the Perfection Platinum topcoat. This would mean I’d need to mask up twice, as I’d need to mask the inverse when painting the off-white areas, however, due to some failings in masking with this coat, that became a virtue! As I noted earlier, I used ScotchBlue standard blue painters tape for most masking, however I thought I’d be clever and use fine line orange plastic tape to go around sharp curved corners, and I was rather pleased with myself when I applied it, stretching it around the corners to create perfect curves. The above turned out to be a disaster in masking as it left too much tension in the plastic tape and it ended up peeling itself off when the solvents from paint got anywhere near them, making a right old mess. I ended up sticking with my trusted, much used and eye wateringly expensive ScotchBlue tape. If there is a corner you are struggling to get around with this masking tape, tear off many small strips of masking tape, layering them one on top of the other, going a few degrees at a time around the corners, as below. By now you are going to be in quite a routine with mixing your paint up and feel pretty confident with your two-pack paint, however, pay attention for this next, top coat, stage, as your mixing ratios have just changed from 3 to 1, to 2 to 1. As before, open and mix the paint thoroughly and give the hardener pot a shake (the hardener on the 750ml packs has a spout as oppose to a conventional paint pot lid), and then mix your paint 2 to 1, in batches of 150ml of hardener with 300ml of paint, in your calibrated mixing cups. I applied three coats to the non-slip areas as I figured these would get the most traffic. I applied the non-slip additive (which has the texture of icing sugar) to coats one and three to make sure the coverage of the non-slip was nice and even. Be careful when you roll out the paint as when you roll it on you will initially end up creating some air bubbles. You can either ‘tip’ these off lightly with a brush, or, do what I did and appeared to offer the best result, and go over your paint one last time with your roller very lightly, applying no pressure at all. This coat of paint will be simplicity itself, with no tricky stanchion bases to go around or any other fiddly bits, I had these coats done in less than two hours each. Once you are done on the last coat of Platinum, let it dry and then remove the masking tape. You are nearly there! Only two coats to go. Your slick areas have now been left too long to be overcoated without rubbing them down, which is fine as these areas need to be super smooth as any imperfection in the shiny, self-levelling finish will be very apparent. Sand the surface with your finer grade sandpaper, being careful to not sand through your undercoat or sand any of the non-slip areas. The Mirka Abranet sheets come in to their own here, not clogging at all and being great for dust extraction if you are not wet sanding. Carefully tack rag the surfaces off (going over the area at least twice) and then mask them up. By now you’ll be sick to death of masking tape, however you’ll be getting very efficient at laying it out accurately. Whatever you do, spend some time on putting on this final application of masking tape as nice sharp, well defined lines will be the difference between this ending up looking like a bodge job or a proper looking result. 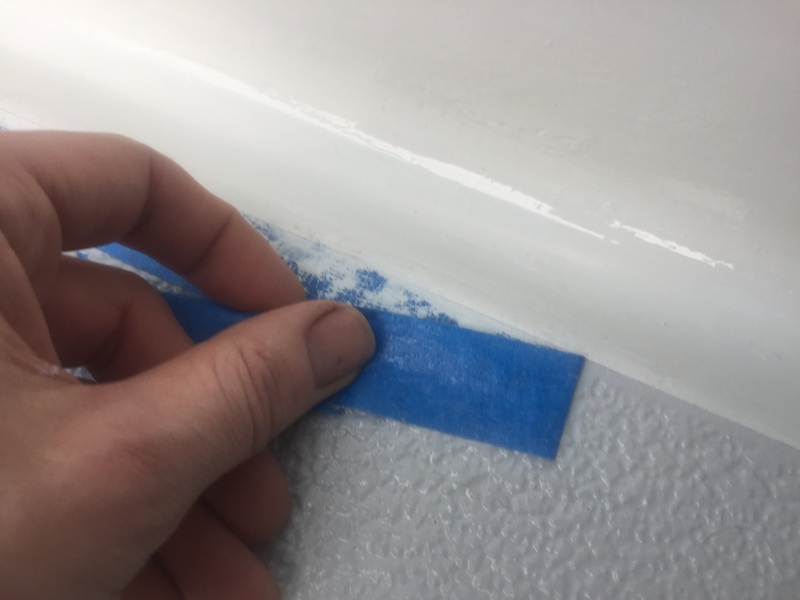 Once again, make sure you run your finger and apply even pressure along the wet edge of your masking tape once you have laid it out to stop any paint bleed creeping under the tape. It may seem time consuming now, but you will thank yourself later. 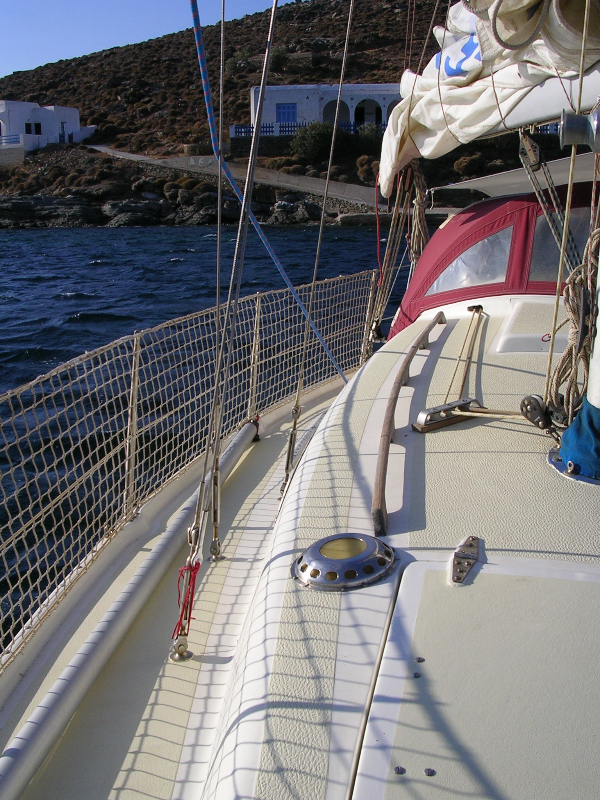 Apply your paint choosing your conditions very carefully – it is critical on the last coat that you have little or no wind (you will be surprised how much dust will reach your deck from the ground) and there is no rain about that might creep in around the mast or rigging to ruin your final result. I cut some bits of pipe that I could use to stand the tarpaulin off the boat to stop it from flopping against my top coat, which was moderately effective where I gaffe taped it on. 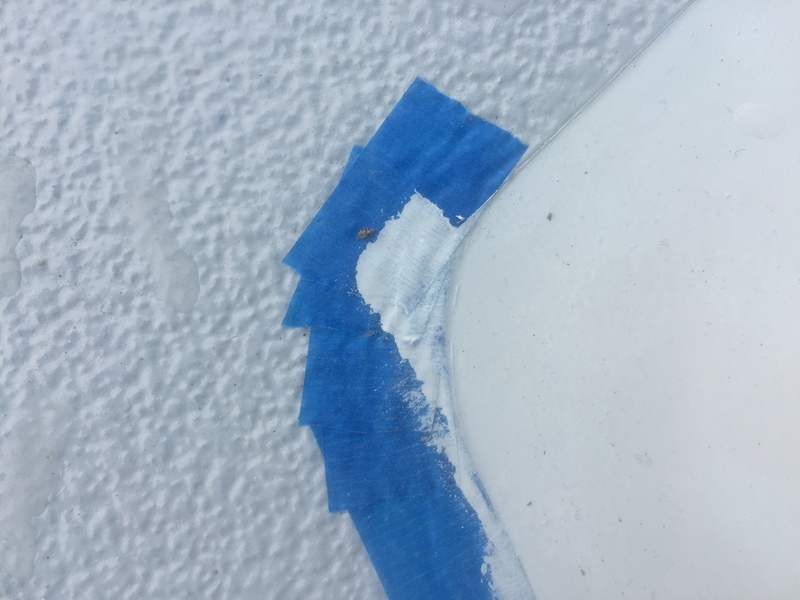 After you have done your final coat, be careful removing the masking tape, being sure to remove it carefully, pulling the tape back directly on itself. It’s unlikely it’ll take any finish off, but its best to be on the safe side. Your back is likely broken, your knees may, quite possibly, never be the same again, however, the painting is done! Stay off the deck now for at least a week, preferably two, to let the paint firm up, giving you the perfect opportunity to spruce up all your deck fittings and paint the hatches you removed at the very start of the process. My old teak grab rails were green, grey and mouldy, as was all the other teak trim around the boat. I set to work sanding these and varnishing them with Epifanes Clear Gloss varnish with the help of Thomas. I remade the engine control backing out of some offcuts of Robbins Super Elite Plus I had stashed away and we set about sanding the other bits back with my Fein multitool and varnishing them back to their glory. Additionally, my old single lever control had always offended me, being stiff and unyielding, with its old paint flaking off and the knob that had been turned by my late father also having turned grey in the sun. So, with a bit of elbow grease (and a fair amount of actual grease), a bit of Hammerite and their special metals primer, it started to look a bit more respectable and befitting of our lovely newly painted deck. Now we have everything prepared and ready to go back on the boat, it’s time to go and carefully lay the ladder (wrapped in many cloths) against the boat and get the boat looking like a boat again. 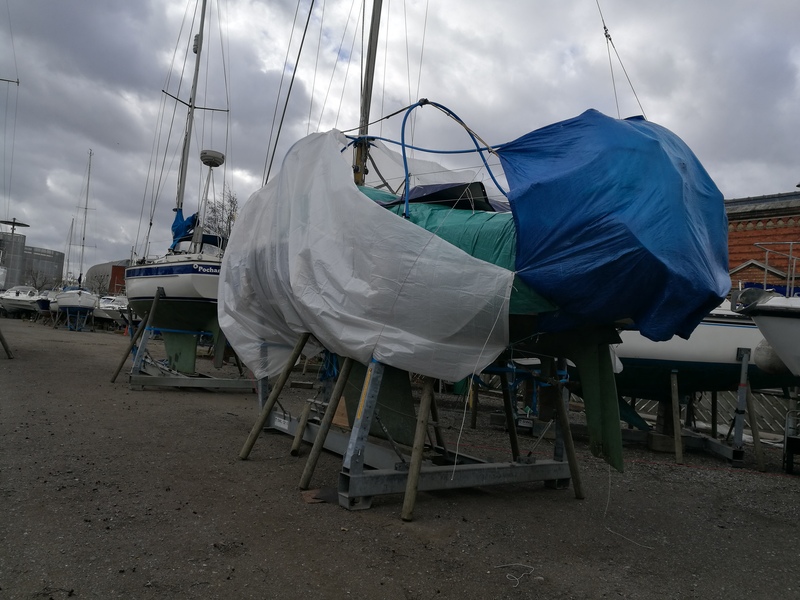 By now you will be itching to cut away the flapping tatters of your deck tent that has flogged and tormented you relentlessly over the preceding weeks, so it’s time to get the Sikaflex out and start attaching your deck fittings and get your pride and joy watertight again. You will be thankful that you labelled all your fixtures and fittings into sandwich bags and you’ll also get a great sense of satisfaction as you open, fit the deck fitting, and discard these bags. Slowly, but surely, your boat will start to look more boat like and less like a floating shanty town. Don’t underestimate this stage, it took me a couple of days to get everything back on and just so. Stand back and marvel at the job you’ve done. In total you will have spent around £800 and taken between ten and fifteen days of pretty intensive labour, however, all those cracks in the gelcoat will be gone. That tatty, dirty, chipped and porous surface, that you had scrubbed in vain for years, has been banished and your deck has been protected. This job was a slog and there were plenty of opportunities for me to make a mess of it. If you were to pay for someone to do the job, the fine folk at Suffolk Yacht Harbour suggest a similar job would have cost around £4,000, including all labour, lift out, prep and paint. Take the rig down! – This would have given me a fighting chance of getting the tarpaulin tight and it may have survived the rigors of storm Doris if that was the case. It also would have meant I would have been able to get the deck tent watertight as there wouldn’t have been any pesky rigging or the mast poking through! It also would have meant no messing about cutting the tarpaulin around the rig and then taping them all back up again. Have a rigid ridge pole to your deck tent. – A forum member gave me this piece of advice lamentably after I had put it up! The main pipe ridge pole, when it warmed up, soon sagged and the head room dropped. Inspect deck fasteners carefully. – Putting my deck hardware back on would have gone twice as quickly had I opened each sandwich bag of fittings, inspected them and cleaned them up. Put a third coat of top coat on – Nathan from the world famous (ish) Pirates Cave, through his contact with his paint supplier, said for full UV protection three coats of perfection should be used. I only applied two of off white, and three for platinum, and I know that will niggle me.